The housing market hasn’t been in the pink of health over the last few years. The last two years in particular haven’t been good for the sector. Events like demonetisation, GST, tighter regulation in the form of RERA, mismatch between buyer and seller expectation on the price front, and lately the NBFC liquidity crisis have impacted the sector. While RERA and GST reforms will help in the long run, the short term demand has been effected. Affordable housing has been a ray of hope in the subdued housing market. According to property consultancy Liases Foras, affordable homes make up 20% of residential property sales compared to 8% in 2016. With the intention of providing homes under affordable housing the FM extended the benefits for one more year under section 80-IBA of the income tax act. The act allows 100% deductions on gains and profits derived from developing and building home projects which meet certain conditions. The projects have to be approved after 1/6/16 but before 31/3/19, this is before today’s announcement. The projects now can be approved till 31/3/20. Builders stand to benefit because they don’t have pay tax on profits in such affordable housing projects, and they have to start new projects by end-March 2020 to be able to get the exemption. To provide more relief to developers and provide impetus to the real estate sector, the budget proposes to extend the exemption period from one to two years for tax on notional rent on unsold inventories. For instance if a developer completed a project of 100 units on 31/12/18, the company manages to sell 60 units in the full year and at the end of 31/12/19 has inventory of 40 units. Under the current regime, the developer will have to add income from notional rent on 40 units and pay income tax on the same. With today’s proposal the developer has one more year to sell of the full inventory. So in the above case the developer has time until 31/12/20 to sell of his project, if on 1/1/21 the developer has inventory of 10 units, notional rent from these 10 units will have to be added to arrive at the developers income. This is a big relief to developers who are already sitting with huge inventories and their balance sheets are not in the best shape. Currently there is income tax levied on notional rent if one has more than one self occupied house. There may be a genuine reason for a family to have two self occupied properties, for instance the working members in the family may want to move close to their work place and move locations, it may not be feasible for the full family to move. This year’s budget proposes exemption of income tax on notional rent on the second self occupied house. This is a welcome move and people who earlier could afford to buy a home but withheld due to this tax implication can make purchases. The definition of “self occupied” is lax, so you could really have an “empty” second house that you perhaps don’t want to rent out, and still not have to pay tax on the notional rent. The budget provides benefit under section 54 – capital gains arising out of sale of residential property. For instance if one would have bought a villa for Rs 2 Cr few years back and sold it in 2019 for Rs 4 Cr, the capital gains arising out of this transaction is Rs 2 Cr. The Person would have to buy another residential property in India to reduce the capital gains tax that one would have to pay. 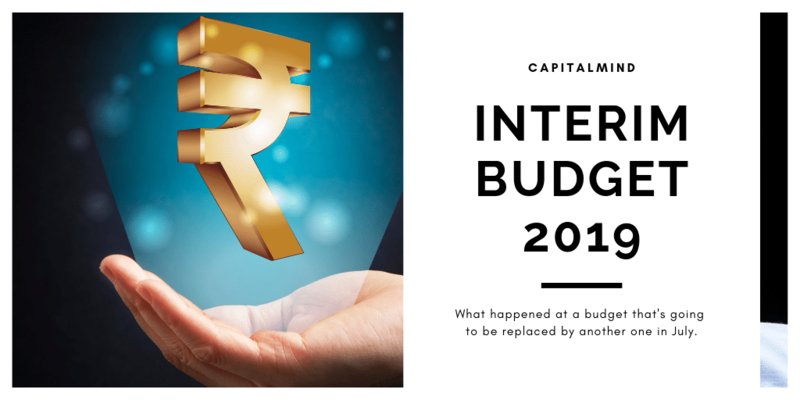 The budget proposes two residential houses can be purchased arising from the capital gains. So now with the 2 Cr of capital gains, two residential homes can be bought instead of one earlier. The proposal is for the tax payer having capital gains of upto Rs 2 Cr. This move should help the housing sector as it will increase the sales volumes of homes and help in reduction of the existing piled up inventory. We feel the measures taken by the government towards the housing sector in this budget are encouraging and should help all players in the ecosystem. Providing one more additional year to sell their project, which will help the developers who already have weak balance sheets and are facing liquidity issues. If the budget pushes people to buy houses, finance companies will benefit from growth. Hopefully these measures should help in reviving the vital housing sector which is reeling under pressure. They will however prefer to wait till the final budget (July 2019) before they make large decisions, since a new government can change the game again.